Last Friday, a 'Palestinian' terrorist named Nashat Milhem opened fire on a Tel Aviv cafe murdering three people. (The number of people Milhem murdered has been corrected in this post). This Friday, agents from Israel's General Security Service killed Milhem in a shootout in his hometown of Arara in Northern Israel. 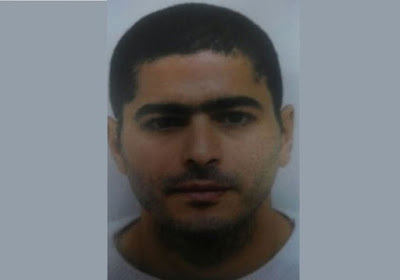 Milhem was found in his hideout and was discovered after the Shin Bet received information on his location on Friday, following an intensive Shin Bet - Israel Police investigation that included many undercover and overt operations to track him down. The shooter tried to escape when he noticed security in the area, and opened fire at security forces using the Spectre M4 Falcon sub-machine gun in his possession, which he also used to murder his victims in Tel Aviv the previous week, the Shin Bet stated. The family has erected a mourner's tent in his memory. That would be the same family whose head called for his son's arrest. The father was arrested anyway four days ago. The PA Ministry of Health initially added Milhem, who is an Israeli citizen, to its list of “martyrs” who were killed by Israelis during the current wave of terrorism, which began in early October. However, the ministry on Friday night removed Milhem’s name from the list. The ministry explained that it documents the names of Palestinian “martyrs” only in areas that fall under its jurisdiction, namely the West Bank, Gaza Strip and east Jerusalem. In other words, the 'Palestinian Authority' still loves him anyway. It will be interesting to see how many 'Israeli Arab' politicians show up at the 'mourning tent' and how their Leftist supporters in Tel Aviv will react if they do. 'A danger to Israeli democracy'?